A new Transparency Market Research report states that the global low-calorie food market was valued at more than US$7.4 bn in 2013 and is predicted to reach US$10.4 bn by 2019. It is expected to expand at a CAGR of 5.90% from 2014 to 2019. The title of the report is “Low-calorie Food Market - Global Forecast, Share, Size, Growth and Industry Analysis, 2014 - 2019”. As per the report, the demand for low-calorie food is on the rise due to changing lifestyles, increasing health-consciousness amongst people, and increasing confidence of people in low-calorie food products on the market. In addition, the rising incidence of diabetes, obesity, and many other health issues is also raising the demand for low-calorie foods. On the other hand, the risk of side-effects caused by certain low-calorie food products may give rise to fatal conditions. This factor may impede the growth of the market for low-calorie foods in the coming years. In addition, high prices of low-calorie foods have decreased their popularity in emerging economies. This factor may also restrain the growth of the market in the forthcoming years. The report segments the market on the basis of type, application, and geography. On the basis of product type, the market is segmented into Sucralose, Stevia, Cyclamate, Saccharin, and Aspartame. Amongst these, Aspartame is amongst the most commonly utilized artificial sweeteners. However, the demand for Sucralose is more as compared to that of Aspartame. The Sucralose product segment is also poised to be the most swiftly developing segment and is expected to exhibit a strong growth rate in the coming years. Stevia has also been gaining popularity owing to the rising preference of consumers for all-natural products. Hence, Stevia is exhibiting tough competition to all other high-intensity sweeteners due to it being a 100% natural and zero-calorie sweetener. 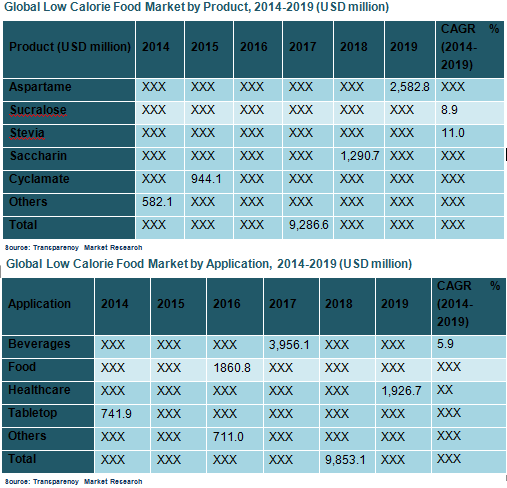 On the basis of application, the low-calorie food market is segmented into beverages, food, tabletop, healthcare, and others. Amongst these, the utilization of low-calorie food products within the beverage sector is poised to rise at a CAGR of 5.90% between 2014 and 2019. On the basis of geography, the market is segmented into Europe, North America, Asia Pacific, and Rest of the World (RoW). North America is the biggest low-calorie food market, trailed by the regional segment of Europe. On the other hand, the low-calorie food market in Asia Pacific and RoW is still in the nascent stage owing to the high prices of low-calorie foods, but these two regions are poised to exhibit lucrative opportunities for companies in the market for low-calorie foods in the coming years. As per the report, the prime players operating in the market for low-calories foods include PepsiCo Inc., The Coca-Cola Company, Groupe Danone, Bernard Food Industries, Inc., Nestle S.A., Ajinomoto Co., Inc., McNeil Nutritionals, and LLC and Cargill, Incorporated, among others.